Shelf mark: Ms. Lat. I 104/12640. Size: 183 x 142 mm. 704 pages, 391 miniatures illuminated in gold. Bound in deep red leather embossed in gold. 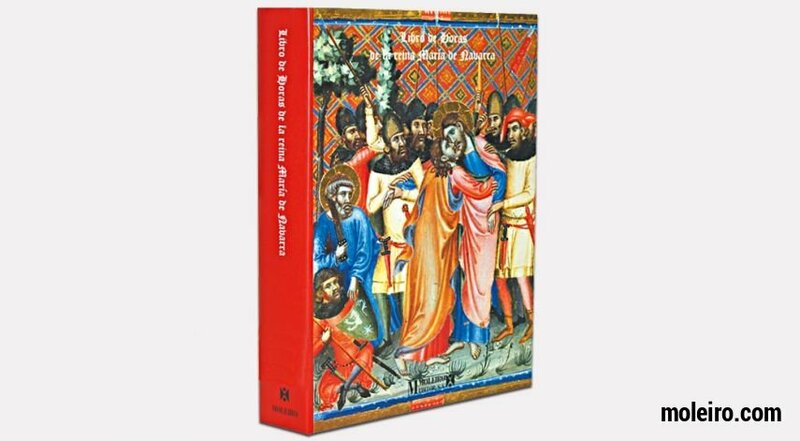 Full-colour commentary volume (600 p.), by Marino Zorzi (Director of the Biblioteca Nazionale Marciana), Susy Marcon (Biblioteca Nazionale Marciana de Venecia), Mª Josefa Arnall (Universidad de Barcelona), Joaquín Yarza Luaces (Universidad Autónoma de Barcelona) and J. M. García de la Mora (Universidad de Barcelona). 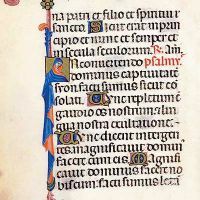 On 26 April 1342, Peter the Ceremonious wrote to his wife, Queen Mary of Navarre, asking her to send him from Valencia, as quickly as possible, the extremely beautiful book of hours painted by Ferrer Bassa (oras pulcriores...quas depinxit Pferrarius Bassa). The document emphasises that this extraordinary work of art was admired far and wide and not only by a king whose meticulousness, love of detail and desire for perfection caused him to be known as Ceremonious. 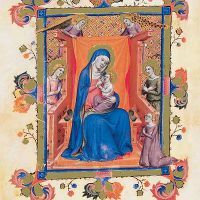 The Book of Hours of Maria of Navarre has been considered to be the first, fascinating and early representative of the globalisation of culture. 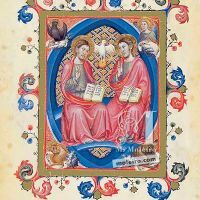 It combines a wealth of lavish illustrations with a rich liturgical content featuring practically exclusive offices, such as the hours in honour of her direct ascendant, St Louis. 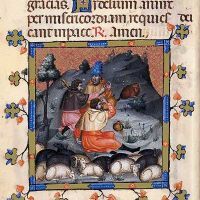 Particularly noteworthy in the Book of Hours of Maria of Navarre is the spatial layout and the use of rich and delicate tones. A characteristic trait of the artist is the way he portrays the figures’ faces with straight, sharp noses and a penetrating gaze: a type that was to persist for many years in paintings in the lands belonging to the Crown of Aragon. 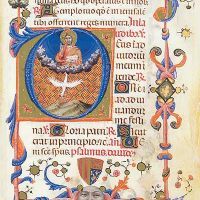 The scenes painted in this magnificent manuscript reveal the Sienese influence which softens the plastic language imposed by Giotto and incorporates the rhythm and vitality of Gothic drawings, resulting in smoother forms and more harmonious compositions. 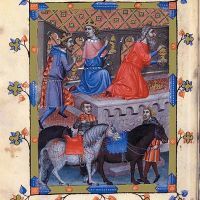 Familiar, intimist details combine with the great sensuality used to depict materials to make this codex – Peter the Ceremonious’s favourite manuscript – the finest of Ferrer Bassa’s oeuvre, his masterpiece and the greatest expression of his art. A perfect example of how the artist used different influences in an eclectic and personal manner, without letting any leave their stamp upon him, to create a personal, original and unmistakable style. 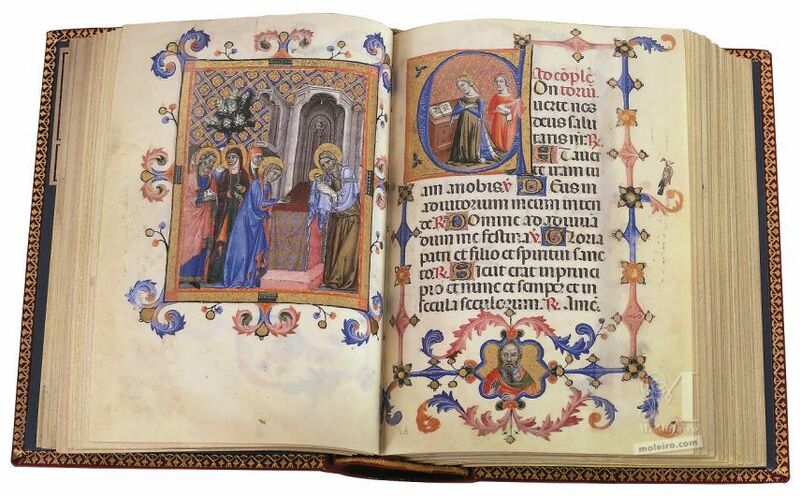 The Book of Hours of Maria of Navarre also has the honour of being the first book of hours to be painted on the Iberian Peninsula.